What is the one thing that no one can do without? Water. Where water crosses boundaries - be they economic, legal, political or cultural - the stage is set for disputes between different users trying to safeguard access to a vital resource, while protecting the natural environment. Without strategies to anticipate, address, and mediate between competing users, intractable water conflicts are likely to become more frequent, more intense, and more disruptive around the world. 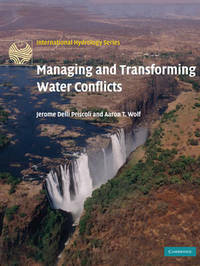 In this book, Delli Priscoli and Wolf investigate the dynamics of water conflict and conflict resolution, from the local to the international. They explore the inexorable links between three facets of conflict management and transformation: Alternative Dispute Resolution (ADR), public participation, and institutional capacity. This practical guide will be invaluable to water management professionals, as well as to researchers and students in engineering, economics, geography, geology, and political science who are involved in any aspects of water management. Jerome Delli Priscoli is a Senior Advisor at the United States Army Corps of Engineers Institute for Water Resources. For 30 years he has designed and run social assessment, public participation and conflict resolution research and training programs. Dr Delli Priscoli has been advisor to the World Bank and the UN water related agencies on water policy issues, and he works closely with international government water ministers. He is author of many articles and books and is the Editor in Chief of the peer-reviewed journal Water Policy. He was an original member of the U.S. delegation to the multi-lateral Middle East peace talks on water, and he has played pivotal roles in each of the five world water forums and most of the critical water resources policy meetings over the last 15 years. He serves on the Bureau and Board of Governors of the World Water Council. The American Water Resources Association awarded him the Icko Iben award for achievement in cross-disciplinary communications in water in 2005. Aaron T. Wolf is a Professor of Geography in the Geosciences Department at Oregon State University. His research and teaching focus is on the interaction between water science and water policy, particularly as related to conflict prevention and resolution. He has acted as a consultant to the World Bank and several international government agencies on various aspects of transboundary water resources and dispute resolution. Wolf is a trained mediator/facilitator, and directs the Program in Water Conflict Management and Transformation, through which he has offered workshops, facilitations, and mediation in basins throughout the world. He coordinates the Transboundary Freshwater Dispute Database, and is a co-director of the Universities Partnership on Transboundary Waters. He has been an author/editor for seven books, as well as almost 50 journal articles, book chapters, and professional reports on various aspects of transboundary waters.